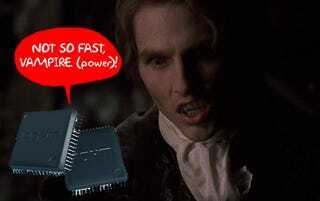 Japanese semiconductor maker Rohm is looking to vanquish vampire power, the energy wasted by tech on stand-by, with its new LSI circuits. The circuits consume no electricity even when in stand-by mode, allowing for a quick power up without the power drain. Considering that roughly 10% of a house's energy bill goes to these silent suckers, Rohm's circuits could save money and the planet at the same time. Rohm estimates that around 15 billion kilowatt hours of electricity, roughly the output capacity of two nuclear reactors, are consumed every year in Japan by devices on standby. In the U.S., vampire power is estimated to cost consumers $3 billion annually.